You can communicate by text while a meeting is ongoing by using chat. You can ask questions or provide input without interrupting the meeting. You can choose to chat with everyone in the meeting or limit it to a private chat with 1 other attendee. All conversations appear in the chat panel, but private conversations are visible only to you and the attendee you’re chatting with. 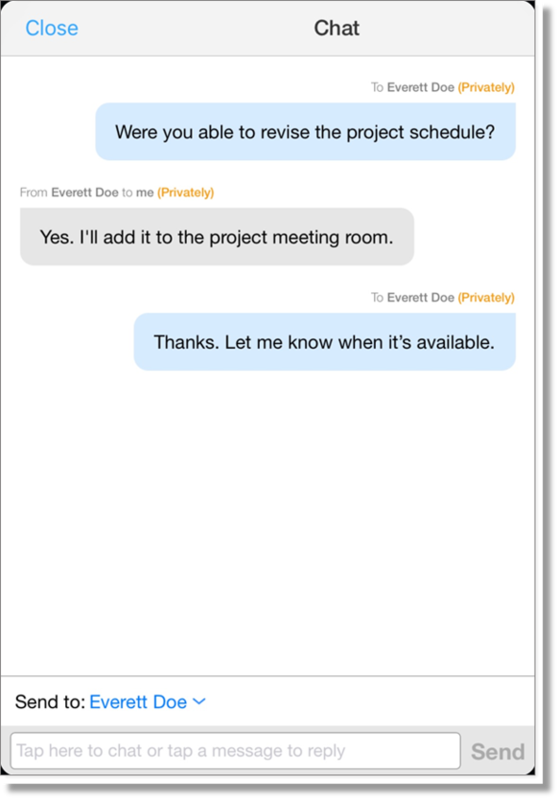 If you’re the meeting host, you can manage the chat settings to allow attendees to chat with other attendees or only privately with the host. Chat conversations with the host are only visible to you and the host. If you’re using the web and desktop apps, you can save the chat conversation at any point. 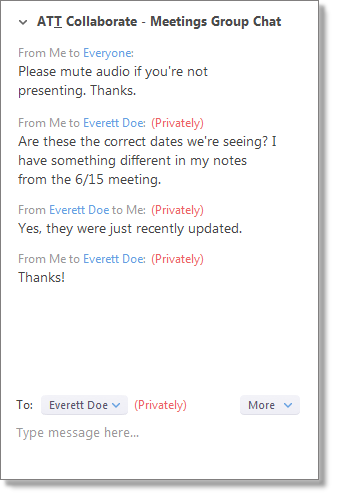 The chat is saved as a text file in the same location as recorded meetings. While in a meeting, at the bottom of the meeting window, click Chat. The chat panel appears on the right side of the meeting window. From the To menu, select Everyone or select the specific attendee you want to chat with. At the bottom of the chat panel, in the text field, enter your chat message, and then press Enter. At the bottom of the chat panel, click More. At the bottom of the chat panel, click More. A list of options appears. While in a meeting, on the menu, tap Participants. The Participants panel opens. At the bottom of the Participants panel, tap Chat. 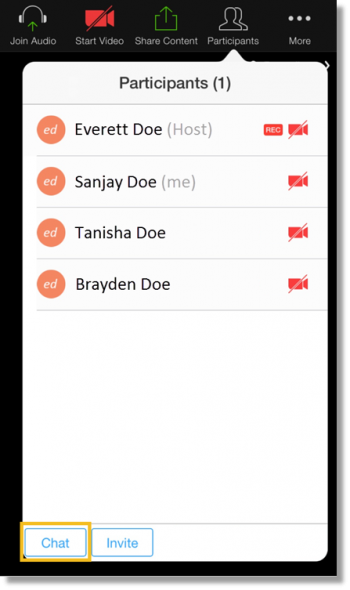 From the Send to menu, select Everyone, or select the attendee you want to chat with. At the bottom of the chat panel, tap in the text field, enter your chat message, and then tap Send.